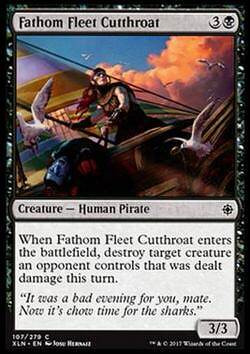 Fathom Fleet Cutthroat (Tiefseeflotten-Meuchlerin) inkl. 0% MwSt. Regeltext: When Fathom Fleet Cutthroat enters the battlefield, destroy target creature an opponent controls that was dealt damage this turn. Flavourtext: ""It was a bad evening for you, mate. Now it's chow time for the sharks.""